FYI: Your web browser is outdated and will cause this site to display poorly. Please upgrade or use a different browser. Receive TWO FREE CUPCAKES on your birthday when you join our Birthday Club. It’s time for our holiday cupcakes. Peppermint Patty and Gingerbread. 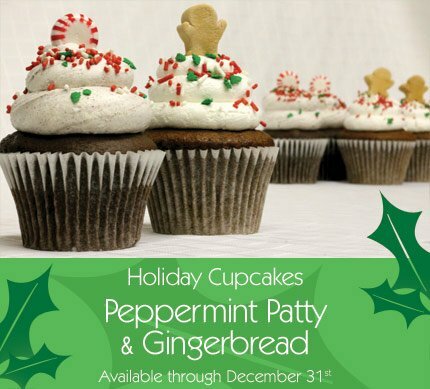 Come try our holiday cupcakes. Peppermint Patty and Gingerbread. 08/17/2011 - by lisahlee - Fullerton, CA - via Yahoo! Seriously the best red velvet and cream cheese cake I have ever ate in my life!! The cake was sooo moist and delicious. I’m so glad they do not use fondont. Everything came out as I imagined it. Thanks so much Patty’s Cake!! Had my B-day cake from Patty’s Cakes, Red Velvet of course and it was amazing!!! 08/19/2011 - Tigress - Fullerton,CA - via Yahoo! I was looking for a local cupcake place and found this by checking Yelp. I am so glad I did. I tried 4 different kinds. I liked them all but my favorite was the red velvet. Yummy!! I’ll be back! 08/20/2011 - Emoney - Fullerton,CA - via Yahoo! 08/14/2011 - - Fullerton, CA - via Yahoo! [Review] Cake Was Like A Dream! Cake Was Like A Dream! Despite all the trials and tribulations of wedding planning, the minute we stepped into Patty’s Cakes it all disappeared. The bakery was pink stripped and ready for cake tasting fun! The customer service was unbeatable: Patty & Philip were the most generous, understanding, sweet, mother & son team of all time. Not only did they give us warm smiles and hugs, they invested in our love story so that our cake was the most descriptive and personalized to us. On our wedding day, Patty herself came to deliver the cake. It was beyond our dreams, Patty took our vision and made it more. Everyone at the wedding could not stop talking about the cake. Even the anti-cake people were taking two slices!!! The cake and the frosting were light and sweet to perfection. Just to highlight the love baked into their cakes, a month after our wedding they even made us two cupcakes just like our wedding cake. We LOVE Patty’s Cakes and are sure that you will too! [Review] The best cakes and cupcakes ever! The best cakes and cupcakes ever! The second I walked into Patty’s, I knew that was the place I was getting my wedding cake from. Patty is so sweet, and her cupcakes are even sweeter! She was able to give me the wedding cake of my dreams for such a reasonable price (and trust me, I went to A LOT a lot of cake places while planning my wedding). The cakes and cupcakes are so moist….I was mostly impressed with how amazingly flavorful the white cake is (and white cake is usually pretty plain). I absolutely LOVE the icing…not too sweet…not too sugary….just purely heavenly. My wedding guests adored the cake’s taste and elegance. And I still want to keep coming back for the cupcakes! She has so many interesting flavor combinations, and I’d love to try them all! I also absolutely love their customer service. Patty’s was the best wedding vendor I worked with. Sunday: Closed. Wedding deliveries only. Custom Order Counter closes at 6 pm on weekdays and 4pm on Saturdays. Sunday: Closed. Wedding deliveries only - Monday: Closed.